The Kingdom of Jutland fights for liberty in this fast-paced successor to the beloved strategy series. Attention, soldiers! Prepare for battle in the coming months, because Valkyria Revolution is launching in the Americas on June 27 for PS4 and PS Vita! 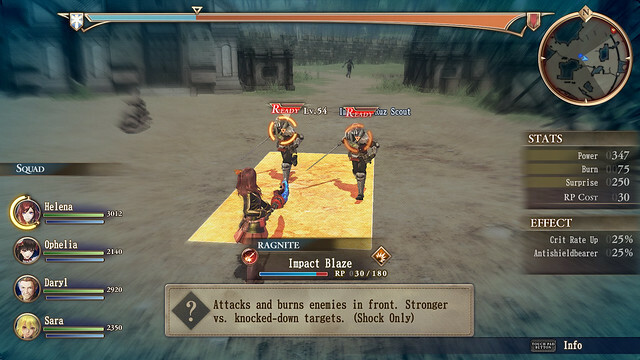 Our previous PS.Blog post covered how the game is quite literally a revolution from previous Valkyria games, but let me give you a brief refresher before you charge once more unto the breach. First things first: Valkyria Revolution is not a sequel to the Valkyria Chronicles series. “Spinoff” would be the right word. It takes place in a whole different timeline, continent, and universe than its predecessors, but familiar elements — such as the precious mineral ragnite and the legendary beings known as the Valkyria — make a return. But at its core, Valkyria Revolution is a very human story about war. The small independent kingdom of Jutland is suffocating from an economic blockade sanctioned by the tyrannical Ruzi Empire, and must resort to war in order to liberate itself and the surrounding lands from the Ruzi’s imperialist conquest. There’s one small problem: the Ruzi Empire have a Valkyria. You know, the living embodiment of death in demi-god form? Yeah, things aren’t going very well for the soldiers of Jutland. But that’s where the Vanargand come in. This elite team of ragnite sensitive warriors have been assembled with the sole purpose of annihilating the Ruzi’s Valkyria with extreme prejudice. Led by the consummate professional Captain Amleth Gronkaer and bolstered by the inspiring presence of Jutland’s Princess Ophelia, the Vanargand are ready to turn the tide of the war in the name of freedom. However, Amleth hides a terrible secret. Is he friend or foe to the country he has sworn to protect? And we’ve got one more thing to reveal. 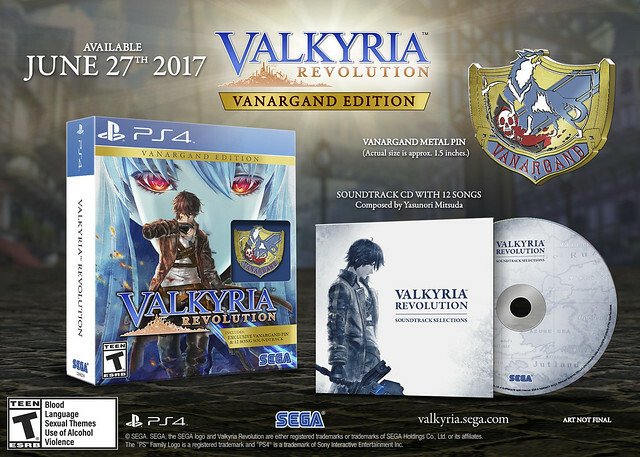 Loyal soldiers are always rewarded for their service, so pre-orders and limited launch copies of the physical PS4 game will come packaged as the Valkyria Revolution Vanargand Edition in the Americas. This special edition comes with a bold pin inscribed with the Vanargand’s ferocious coat of arms, a 12-track soundtrack by the extremely talented Yasunori Mitsuda (Chrono Trigger, Stella Glow), and stunning outer box. Quantities are limited, so grab your copy of the Vanargand Edition on the double! Valkyria Revolution will be released physically and digitally for PS4, and as a digital-only title for PS Vita. I don’t the option to buy on Amazon yet. Please get the listing added. Sega has been killing it on PS4. Or do a limited run VE with a download code. I’d love to have a physical Vita release, I just can’t bring myself to pay $40 for a digital only game. I’ll get it on the PS4 and still enjoy it, but I’d much rather be playing it on the Vita. Do we know when pre orders will be up? I gotta snag that Vanguard Edition; it’ll look great next to the Chronicles Remastered Steelbook. I don’t think you realize this but the “Vangarand Edition” is all preorders and launch copies. There is no normal edition of the game. All preorders will be the Vangaurd Edition. The “Vangaurd” are the front units of an army. This is just a cutesy way of saying “Day 1 Edition” since they are the front of the sales. Sweet out a day before my 31st birthday. The Ps4 version will be a early birthday gift to myself. I’ll definitely be looking into getting this. Also great time of the year to release it, usually during the dry spell! Remember a classic arcade game that SEGA has released back in 91 called “Spider-man:The Videogame”? I’ve been telling the Sony guys to let SEGA borrow the license so that the game can be released on PS4. But are they listening to the Playstation Nation? I have no idea. SEGA can release the game exclusively on PS4 if that would make Sony happy. So what does Sony have to lose? I don’t get it. Please SEGA, talk to the Sony guys, and let them know that SEGA is interested in re-releasing this classic game because it truly deserves recognition. Sony doesn’t own the Spiderman license. Sony Pictures Entertainment (SPE) owns the movie license. Activision used​ to own the game license, but that has reverted back to Marvel/Disney, which is why we’re getting the new game from Insomniac. If you’ve been doing anything to Sony other than posting here on the blog (which is useless anyway), you’ve been barking up the wrong tree. You need to be trying to get Sega and Disney to talk about releasing that old game. Sega doesn’t have the rights to release Disney properties without Disney’s permission, and Disney probably doesn’t care about a nearly 30 year old game. The “PlayStation Nation” has nothing to do with this conversation. While I would have loved to get the LE on Vita I’m glad you guys are releasing it in some form so I can buy it! We’re going to be talking about the games of 2017 for years and years. Valkyria Chronicles was THE single reason I bought a PS3. I’m so sad to see it in digital-only form on the Vita. This is a series that deserves to be preserved in hardware format for all its fans. Maybe Sega can work with Limited Run Games or NISA to get a limited physical run? Then you’ll be glad to know it’s getting a physical release on the successor hardware of the console the first game was originally released on! And the same console that the remaster was just released on at that. Isn’t that awesome?! Sweet! Now can we please get Yakuza Kiwami’s release date? Some kinda digital “ps4/vita crossbuy/bundle” would be appreciated. Even if at the digital PS4 price. I sadly pass on day one buys for multi-platform games that don’t have crossbuy, and wait tell one platforms content is on sale. I would like to buy day one this Vanargand edition… if it was available for PS Vita. I’ll pass on the PS4 version. As it has been pointed out by others, nowadays there are options for limited physical releases of PS Vita games, such as LEs from Nisa (Gust did so for some Atelier games) or Limited Run Games. I really hope you guys will explore some of these options in order to make a physical Vita version an option. Don’t get me wrong: digital is better than nothing, but its drawbacks do make a retail version a much better option. While I realize a full retail release might not be a viable option, a limited release should still be possible. 1. Thanks very much for bringing this to the west. Looking forward to it. 2. Did the devs originally intend for this to be a “spin-off” or did they get scared by fans reaction in Japan and quickly decide “It takes place in a whole different timeline, continent, and universe than its predecessors,”? One thing I discovered when playing the first on PS3 was that this game, this world, lends intself incredibly well to other genres and I don’t think Sega should be scared of having this a mainline game that takes place in the same world as the first. When I played the first game it sparked my imagination in how it (this same world) could expand successfully into other genres and styles or takes on the same genre. Don’t be scared into making the same game over and over in the “mainline” series and shunting anything different off into a ” whole different timeline, continent, and universe than its predecessors,”. It starts to hurt the series integrity when stuff is removed that far from the established world. It makes it seem like the game is a waste of time (for players and devs) because it’s so far removed that it doesn’t matter and people can skip it without missing anything. I was interested long before this launch edition was announced, but including a soundtrack by Yasunori Mitsuda guaranteed my purchase. Thanks for this awesome treat! Shame about the Vita version being Download Only. Cross Save? No Digital Cross Buy Promotion? So in other words, the franchise name and a very tiny little bit of lore is being employed solely to lure in fans! It may or may not live up to the franchise’s history, but definitely NOT something to consider until it’s released and reviewed many times. I’ll wait for them to confirm another true sequel to Valkyria Chronicles before supporting something that took away the best part about the original, the unique and great battle system. Man I loved the first game, the second was ok and got to play a Japanese demo of this one. I am really looking forward to it. Too bad this game looks like garbage and nothing like the originals. I get that it’s a spin-off but I’m having a hard time believing anyone within the fan base asked for this game.